I keep finding myself telling followers of this blog about these fun little how-to videos I’m making for my beginning watercolor classes. Three in particular—on brush-drawing—just seem perfect for journallers. Brush drawing is a great way to try to see and capture the essence of something—both how it looks and how it feels. In a brush drawing, the challenge is to use just a few strokes to give the impression of something in nature. When you watch someone doing this sort of painting, it seems so magical that most people just assume it’s really difficult. But in fact, brush drawing can be much easier than drawing an accurate outline with a pencil. Often, when people say they “can’t draw”, what they mean is that they find it difficult to represent something with an accurate outline drawing. It’s not too surprising that we (especially in western cultures) sometimes associate “drawing” with “outline drawing”. Our eyes and brains like to pay attention to edges, because in navigating our way through the world, it helps a lot to know where the wall ends and the doorway begins. Or what is table and what is coffee cup. And when you pick up a tool that makes a line, like the pens and pencils we use every day, it’s natural that you would use it to make . . . well . . . lines. This can lead to frustration and the (erroneous!) assumption that you “can’t draw”. Drawing an accurate outline requires pretty good eye-hand coordination, or a lot of checking and measuring (at least visually) the relative position of parts of the outline. Both of these require practice, so people without a lot of practice are often frustrated when they try to make an “outline drawing”. But even people who don’t have a lot of practice are pretty good at assembling a representation of something out of a collection of shapes. It’s a bit like assembling a simple puzzle. If you have all the pieces, you can pretty easily assemble a puzzle with 8 or 10 or 12 shapes. In the same way, if you mess around with a brush until you know how to make a bunch of different shapes with it, you can put those shapes together fairly easily to make images. The reason people sometimes think that brush drawing is really difficult is that they start with something out there in the world and try to figure out how to draw it with a brush. Often without having first explored all the shapes the brush naturally makes. But, if you start the other way ’round, it’s suddenly much easier. See what shapes the brush will naturally make, and then assemble them into images. It’s easy if you let your imagination have free rein! This week, I hope to convince you to give brush drawing a try. And, I’m including some videos to help you out. You don’t need to go out and buy expensive brushes for this. Try it with whatever brushes you have, or buy a really inexpensive set of hobby brushes to get a variety of shapes. Or try with some house-painting brushes, if you have those around. If your brushes are small, make small images. If they’re large, work large. Each brush has shapes it likes to make. Work with those shapes! In this first video, I demonstrate some shapes that can be made with 4 different brushes. These are by no means all the possible shapes! This is just to give you some ideas. Explore with your brushes. Do any of these shapes remind you of something? If so, that might be a good candidate for a brush drawing. 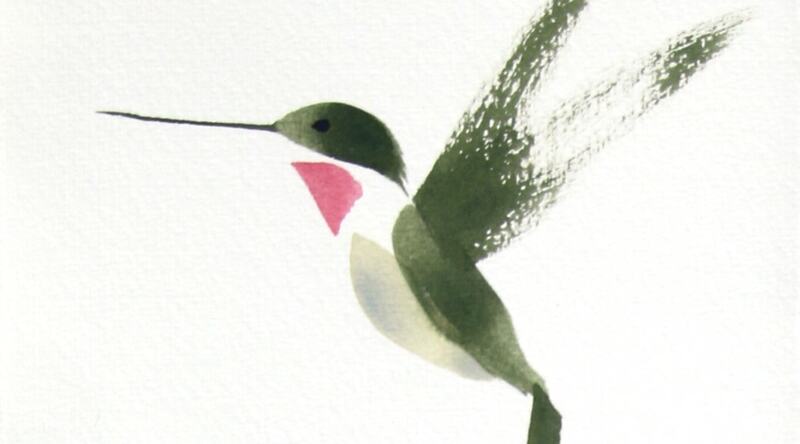 In the next three videos, I demonstrate how to make a few brush drawings . . .
. . . a bee on a coneflower . . .
. . . a hummingbird . . .
. . . and, of course! . . . a dragonfly! What else can you assemble from the shapes your brushes will make? Share your drawings in the comments, and challenge the rest of us to give your ideas a try!